I love this book! I cannot believe that I only discovered it a short while ago because it has had me in laughing and chuckling along mode for a good hour or two as soon as I received it. There is something very special about being British! 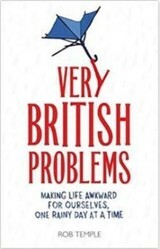 Let me apologise in advance to my American readers because as you might expect this review of Very British Problems will be written unashamedly with English spellings of words such as humour! There is lots of humour to be found in the book and more than a grain of truth in some of the insights it offers. Let me tell you how I came across this wonderful little book.It was a chance remark on Twitter by Stella Creasy a Member of the British Parliament with a great sense of humour. She had commented that she was getting to the point of "tutting in that British way" at two noisy children sat opposite her on the train whilst she was trying to work. So thank you Stella for leading me to find the book. Although my partner might not be so thankful! I keep reading bits out and then laughing out loud! What do we mean by "Very British Problems" you may be wondering. Or perhaps the question occurs to you as to "What does it mean to be British?" I could get very serious here and talk about democracy, respect for others, Shakespeare, the Industrial revolution, The Queen and so on. Or we could perhaps recall warm beer, cricket, church bells ringing, stiff upper lips and the like. 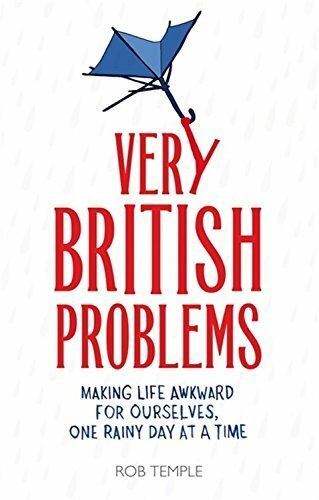 But whilst those are all are things that people might often associate with Britain and being British, the book goes right to the heart of those Very British Problems. They are "problems" or behaviours that any Brit will recognise, cringe at and then of course laugh at. They are behaviours and attitudes that really do differentiate us from others. The sort of behaviours and attitudes that led to Jennifer Holloway writing a book with the title Personal Branding for Brits! This book uses brilliant humour to convey some of those things that any Brit will instantly recognise. Any non-Brit who has had the immense good fortune to visit this “Sceptred Isle” will smile at them because they will have invariably have encountered them. Saying "I am awfully sorry I don't smoke" when someone asks you for a light! Why on earth do we apologise for not smoking? We do you know! Tutting and shaking your head very slightly when your train or tram is held at a signal. What difference do we think our tutting is going to make?Are the signals suddenly going to change and apologise for delaying us?! Now this one is a favourite of mine and one that makes my partner cringe every time I do it! Saying "Thank you and you are very welcome" when someone fails to say thank you for holding the door open to let them go through. We have a very peculiar obsession with the weather. For no reason at all when we walk into the reception of a building for the first time and are met by the receptionist we will say something along the lines of "Lovely weather we are having for the time of year." That despite the fact it is absolutely pouring down with rain outside! Many of my American friends tell me I really am "so very British" and will smile when they hear my "oh so cute accent." So if you are an American who really wants to understand what we Brits are all about then you must read this book! If you are from this Blessed Plot then you will want to grab this book and read it because you will be laughing in your seat on the tram or train - but obviously quietly so as not to disturb your fellow passengers. Buy Very British Problems Now! I Am British - Where Can I Buy This Book? "Ahem! Excuse me but I am British and that book up there seems to be priced in those dollar things. Where can I get a copy of this book and pay in real money?" Which Of The Very British Things Do You Do? A newspaper headline in the late 1940s declared, "Thick fog in English Channel, Continent cut off." How very British! I have a curiosity because some of my ancestors came from there. In fact, my great grandfather died in England in 1960, rather recently by some standards in an area called Sussex. Others came from Nottinghamshire and places near that part. So, I enjoy reading about England. Thanks for writing this piece. I found the one about the weather quite amusing, and yes, I believe I have actually heard Brits say that! I once tutored a Hungarian girl who said that I was very British, as even on a hot day I drank tea. An amusing read. I don't know where the idea that British humour is sarcastic comes from though. I am never sarcastic at all. My husband isn't either. I ignore it if people are sarcastic to me and act as if it has gone above my head. Maybe that is my "sarcasm". Regarding smoking, I am more likely to say, "yuk, I don't smoke " and laugh as if to say why would I ? So if someone doesn't say thank you to you, you say it for them? Is this done sarcastically? There's no doubt that the Brits make some of the best TV Shows from the classics to modern day shows. Let's celebrate the Best British Comedy TV Shows and discover more about them! Which are the best British TV Shows? Is it Sherlock or Miss Marple? Perhaps you are a fan of Downton Abbey? Or a dedicated Whovian or Doctor Who Fan? Let's look at the very best!